Visitor center hours: Daily 9 a.m. - 4 p.m. The view of snow-capped mountains can seem a bit surreal when Las Vegas is still feeling the heat of the desert sun. But at 11,916 feet in elevation, Charleston Peak is in fact dusted with snow for more than half the year. While it may seem like a world away, this cool respite is only about 45 minutes from the city. One can actually see Mount Charleston and the rest of the Spring Mountains from the Strip. This protected recreation area provides a serene escape where one can enjoy hiking, picnics, forests, disc golf and even snow sports. Mount Charleston lies 35 miles northwest of Las Vegas and is comprised of several designated wilderness areas nestled within one another. 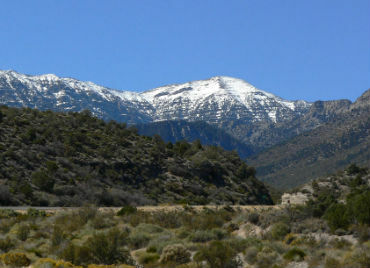 Charleston Peak and the Spring Mountain Range are incorporated into the Mount Charleston Wilderness area and part of the larger Spring Mountain National Recreation Area, which is located within the 6.3 million acre Humbolt-Toiyabe national forest. The Mount Charleston Wilderness area is 57,441 acres of forests and mountains that stretches across the Spring Mountain Range of northern Nevada. Established in 1989, it protects a large bristlecone pine forest and a roaming herd of rocky mountain elk among other plant and animal species unique to the area. The Spring Mountain National Recreation Area consists of 316,000 acres of wilderness, and year-round recreation including camping, hiking, access to off-road trails and undeveloped areas, horseback riding, rock climbing and skiing and snowboarding in the winter months. Perhaps the best way to get acquainted with the Mount Charleston Wilderness Area is through a hike. With more than 52 miles of trails available, there’s plenty of options for both the experienced and novice. These trails let hikers meander through the juniper, mountain mahogany, aspen and ponderosa pine trees while enjoying views of the alpine slopes and dynamic limestone cliffs. The Mary Jane Falls trail is a popular two-hour hike easy enough for the whole family and includes a visit to a cave and waterfall. Longer and more scenic hikes in the area include the Bonanza Peak and Charleston Peak trails. Single-track mountain bike trails are found on the Bristlecone and Sawmill trails. The best trails for horseback riding are along the upper section of the Bristlecone Trail, but equestrians are not allowed at Cathedral Rock, upper North loop, Mary Jane Falls and Robber’s Roost or in developed campgrounds. Mount Charleston Trail Rides in Kyle Canyon offer guided horseback tours. Mount Charleston is also a major draw for avid rock climbers who flock to the area for some classic bouldering and climbing challenges on the pristine limestone. Popular spots include the The Hood overhang located along Trail Canyon and Robbers Roost. For those who want to stay mostly indoors, the scenic drive up Kyle Canyon offers a brilliant overview of the wilderness area. Drivers should go across the Deer Creek Highway and down Lee Canyon for excellent views. Be sure to fuel up before departure because there are no gas stations within the recreation area. Picnic areas are available year-round and include tables, grills, fire rings and bathrooms. Some have a venue for friendly competition in horseshoe and volleyball courts. Most of the picnic areas are closed during the snowy winter months, with the exception of the Foxtail picnic area where you can start a playful snowball fight, build a stout snowman or try some sledding. For many, Mount Charleston is all about the miracle of experiencing snow less than an hour away from Las Vegas. Lee Canyon, which is within the wilderness area, is home to the Las Vegas Ski and Snowboard Resort. This resort receives 240 inches of snow a year and offers skiing Thanksgiving through the middle of April. 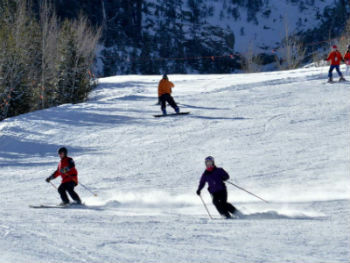 As the most accessible ski resort to Las Vegas, Lee Canyon can get quite busy on winter weekends. While smaller than most mega-resorts, it does feature 20 groomed trails and 250 acres of lift-served terrain. 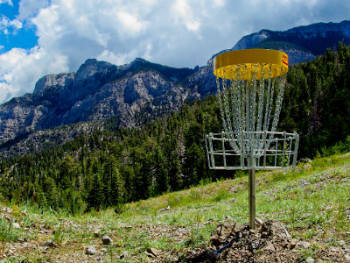 The resort stays open during summer, offering scenic chairlift rides, and is also home to a popular disc golf course. Summers at Mount Charleston are comfortable, with mild daytime temperatures in the 70s. This can be a major relief to visitors arriving from the desert where summer temperatures soar into the 100s. Summer can be the best time to enjoy a Mount Charleston hike as the rest of the Las Vegas may be too hot for outdoor activity; however, July and August are also part of “monsoon season” in the region, which means some campgrounds may be closed due to increased rain. Naturally, Lee Canyon and other parts of the mountain are popular as the winter snow comes. Snowfall can sometimes be extreme, so be sure to check the Mount Charleston website for road closures before making the trek. The Resort on Mount Charleston is a full service hotel and a centrally located home base for exploring the area. In the morning, guests can grab coffee and a muffin at The Bistro or have breakfast at A Cut Above, the hotel restaurant. After a long day of skiing or hiking, one can relax in the wet or dry sauna then enjoy the spacious lobby on plush couches in front of the fireplace. 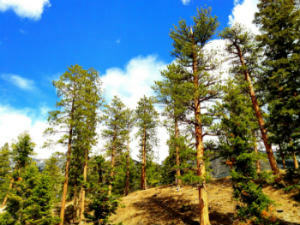 For a charming rustic overnight stay, book a cabin at Mount Charleston Lodge located near the top of Mount Charleston. Cabins can include a fireplace, jet tub, a balcony with a view and a small kitchen. There are no phones or Wi-Fi available in the cabins, and cell phone coverage is spotty. This is a place where you can really unplug and reconnect with nature. The lodge restaurant serves three meals a day and offers a menu of popular dishes, including the free-range Elk Burger. Campers can settle in at one of the five developed campgrounds in the Spring Mountains. Most of them are located in the well-traveled Kyle and Lee canyons. Simple tent camping is permitted at these sites, and guests can expect typical campground amenities such as toilets, picnic tables, a fire ring or grill, potable water and even electricity (at Fletcher View only). For more rugged camping that only includes the amenities you decide to carry in, set up in one of the dispersed camping areas at Westside-Pahrump, Cold Creek and Mountain Spring, which are accessible by off-road vehicles, bikes and on foot.